The Perth Mint commissioned American sculptor and engraver John Mercanti for the reverse design featured on the 2014 Australian Wedge-Tailed Eagle Gold Proof High Relief Coin. The choice of this artist is interesting as John Mercanti is perhaps best known for his reverse design on the American Silver Eagle Coins of a heraldic eagle with shield. "I decided to show the eagle in flight, approaching the stump, wings spread so that the viewer could see the majesty of the wings," describes artist John Mercanti. Offered as the seventh annual release in a series, the Perth Mint issued the Australian Lunar Series II 1/20 oz Gold Colored Horse Coin. 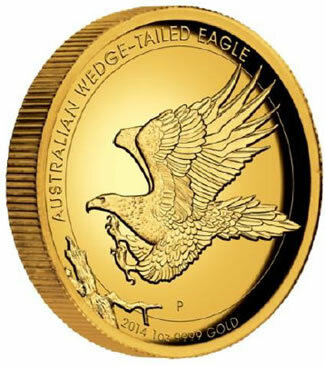 This 99.99% pure gold product was created to be a part of the ongoing Lunar Series II 1/20 ounce gold coin collection. As such, the mintage is capped at just 500 in this packaging. The reverse contains a colored image of a horse galloping in a scene of stylized clouds and mountains. The Chinese character for horse is also seen in the design. 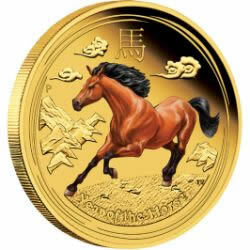 Offering ten different views of standing horses in color, the 2014 Year of the Horse 1/10 oz Gold Square Ten-Coin Collection is also now available from the Perth Mint. This set features a maximum mintage of just 1,500 collections with no more than 7,500 of each individual coin released. The ten coins of the set are shipped together in a single display case. A numbered certificate of authenticity is also included.